Huangdi The Yellow Emperor is a Microgaming slot machine game with 5 reels and 25 paylines. The online slot game based on the legendary Chinese hero, the game benefits from stacked slots symbols in the base game which expand matching high symbol of slot on the other reels. It’s all about the Free Spins feature where up to 30 free spins can be won – more importantly, the Dragon wild is stacked on reel 1 meaning you can get plenty of wild reels if you’re luck is in. With online slot game Huangdi The Yellow Emperor you are taken to ancient China where one their most iconic heroes comes to life. With an epic feel, it has explosive features. Set in a time of the historical battle of Zhuolu, it’s based on Huangdi’s victory against the Nine- Li Tribe – it has a Chinese feel with a focus on history and culture. The slots symbols on the reels include Chinese calligraphy-styled playing cards (A, K, Q, J and 10), instruments, medicine boxes, Huangdi swords and Huangdi himself. There’s also a Huangdi wild which substitutes for all slots symbols except the Dragon scatter. The instrument, medicine box and Huangdi’s sword appear stacked on reel 1 whilst Huangdi appears stacked on all 5 reels. When any full slots symbols stack appears on reel 1, they will expand all matching high symbols of slot on the other reels – the matching symbols only expand when part of a winning combination. 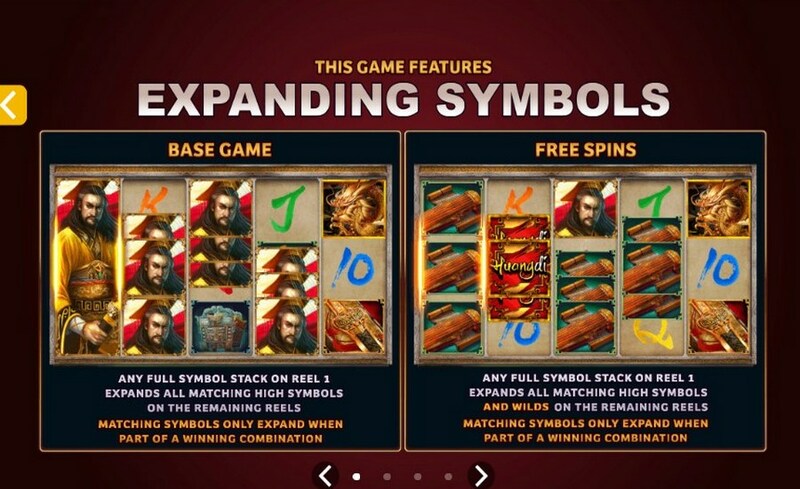 This also applies in the Free Spins feature – more on this below. 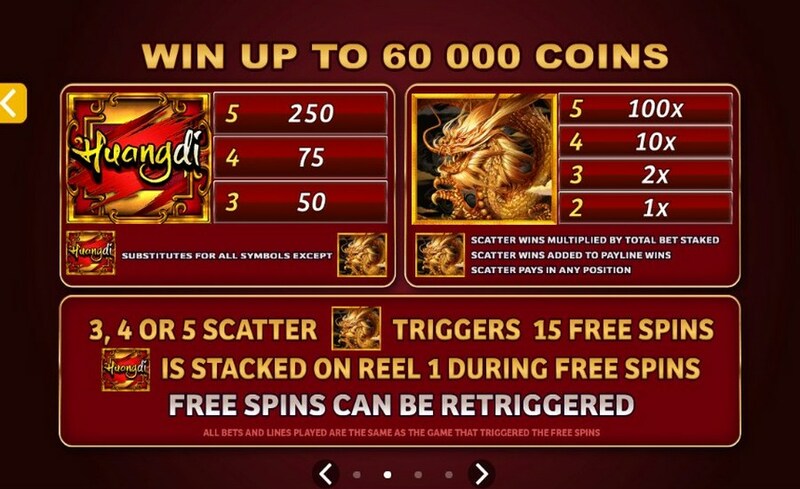 If you get 3 more Dragon scatters anywhere in view, you will trigger the Free Spins feature and with it, 15 free spins. 4 scatters will give you 10 times your stake as a bonus and 5 scatters will reward you with 100 times your stake. The Huangdi wild symbol is stacked on reel 1 throughout the feature meaning that if other wilds appear on the other reels, they too will expand to take over their respective reels! Furthermore, look out for 3 or more Dragons during the feature as this will retrigger the feature giving you 15 additional free spins – which takes your total to 30. Simple the feature may be but it can be highly rewarding if you get a few wild reels. Huangdi The Yellow Emperor is a medium variance slot with the bigger wins coming in the Free Spins feature – this is due to the expanding wild symbols. 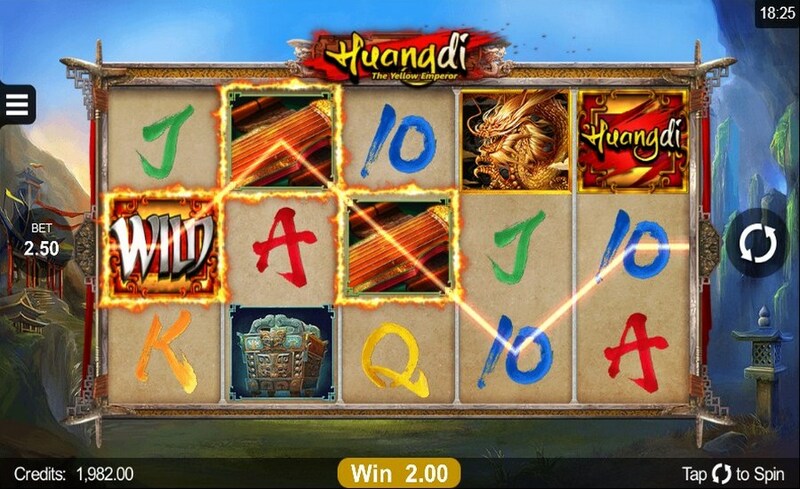 With wins of up to 240 times your stake on each spin, make sure you enter the world of Huangdi for a legendary experience.